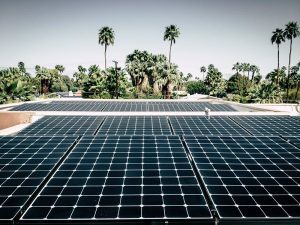 When you buy a solar system, you are buying the panels, the inverters, the balance of the systems equipment, the time to design and install, permits, and hopefully a little margin for the contractor. It often seems like a moving target because panel prices vary greatly and there are plenty of installation corners that we’ve seen companies cut to increase their profits. With our best in class equipment and installation care and techniques we will not be the cheapest installer, but our systems will look the best, last the longest, and are backed by the best warranty and customer service. Currently in the Coachella Valley we see a full-time resident needing between 3-4 kilowatts of solar for every 1000 SF of home. 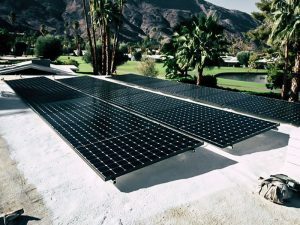 Prices vary between panel type and installation techniques from $3.50 – $4.50 per watt. So a 3000 SF house would on average need a 10.5 KW System @ $4.00 per watt that would be a $42,000 solar system. With the 30% Federal Tax Credit, the net Cash price would be $29,400. In this scenario, we would expect the system to recoup this cost within 5-7 years of electric bill savings, and then have decades of profit production ahead. *This is just a sample. Solar orientation, energy saving items, budget, and aesthetics all play into sizing a system. We can’t reiterate enough how important it is to do your homework on who you are doing business with. We are a general contracting company specializing in custom installations with balanced energy solutions and base our business solely on our client satisfaction. Buying per watt without digging into the way a company handles their installations and after the sale customer service, can be costly. Yes, we fix other companies’ SunPower and non-SunPower systems, but we truly spend the extra time and money to avoid any defects or mistakes, and in true HPE fashion, bend over backward if any come up. Our 20-year labor warranty is included with every one of our installations. It’s not marketing fluff but rather a commitment to the integrity of our workmanship, but also to your long-term satisfaction with your system and HPE.